Citation Information: JCI Insight. 2017;2(14):e92293. https://doi.org/10.1172/jci.insight.92293. The role of negative regulators or suppressors of the damage-associated molecular pattern–mediated (DAMP-mediated) stimulation of innate immune responses is being increasingly appreciated. However, the presence and function of suppressors of DAMP-mediated effects on T cells, and whether they can be targeted to mitigate T cell–dependent immunopathology remain unknown. Sialic acid–binding immunoglobulin-like lectin G (Siglec-G) is a negative regulator of DAMP-mediated responses in innate immune cells, but its T cell–autonomous role is unknown. Utilizing loss-of-function–based (genetic knockout) and gain-of-function–based (agonist) approaches, we demonstrate that in the presence of certain DAMPs, Siglec-G suppressed in vitro and in vivo T cell responses. We also demonstrate that its T cell–autonomous role is critical for modulating the severity of the T cell–mediated immunopathology, graft-versus-host disease (GVHD). Enhancing the Siglec-G signaling in donor T cells with its agonist, a CD24Fc fusion protein, ameliorated GVHD while preserving sufficient graft-versus-tumor (GVT) effects in vivo. 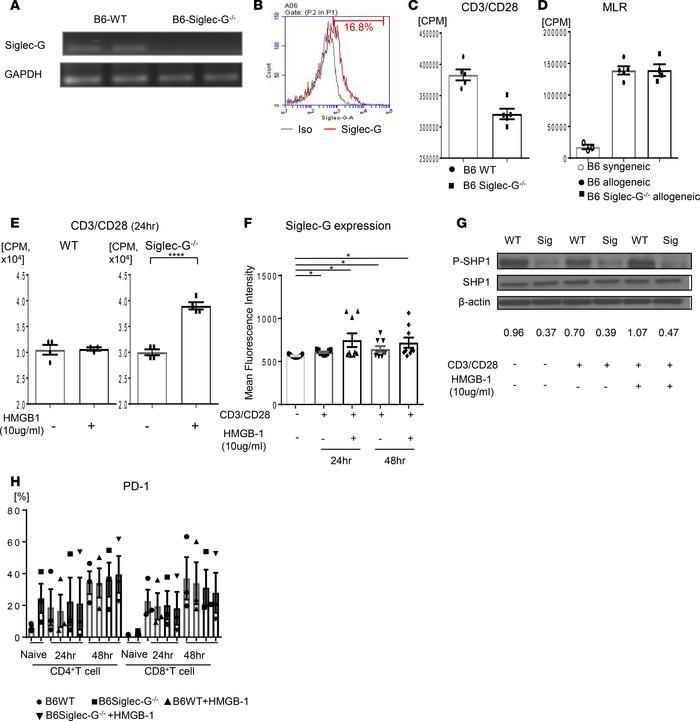 Collectively, these data demonstrate that Siglec-G is a potentially novel negative regulator of T cell responses, which can be targeted to mitigate GVHD. T cells express Siglec-G and it represses their responses in the presence of DAMPs. (A) Naive CD90.2+ T cells were isolated from B6 WT spleen with MACS and expression of Siglec-G was evaluated with RT-PCR for Siglec-G mRNA. GAPDH was used as control for RNA loading. Representative data are from 1 of 3 independent experiments. (B) Siglec-G expression of CD3+ T cells in spleen by FACS. Representative data from 3 independent experiments are shown. (C) Isolated splenic CD90.2+ T cells from either B6 WT or Siglec-G–/– animals were incubated with anti-CD3 (2 μg/ml) and anti-CD28 (1 μg/ml) antibodies for 48 hours and analyzed for proliferation following 3H-thymidine incorporation during the last 6 hours of incubation. (D) In vitro mixed lymphocyte reaction (MLR). Isolated splenic CD90.2+ T cells from either B6 WT or Siglec-G–/– animals were cultured with bone marrow–derived DCs derived from syngeneic B6 or allogeneic BALB/c animals for 96 hours and analyzed for proliferation following 3H-thymidine incorporation during the last 16 hours of incubation (P = not significant [NS] between groups). (E–I) Isolated splenic CD90.2+ T cells from either B6 WT or Siglec-G–/– animals were incubated with anti-CD3 (2 μg/ml) and anti-CD28 (1 μg/ml) antibodies in the presence or absence of HMBG-1 (10 μg/ml) for 24 hours and analyzed for proliferation following 3H-thymidine incorporation during the last 6 hours of incubation. Representative data from 3 independent experiments are shown. ****P < 0.001. (F) Siglec-G expression on T cells was analyzed by FACS at 24 and 48 hours after stimulation. Combined data from 3 independent experiments are shown. *P < 0.0125, adjusted with Bonferroni correction. (G) Protein expression of phosphorylated (p) and total SHP-1 at 48 hours was evaluated by Western blot. Representative data from 1 of 2 independent experiments are shown. (H) PD-1 expression on CD4+ or CD8+ T cells at 24 and 48 hours after stimulation was analyzed by FACS (P = NS between groups). Pooled data from 3 independent experiments are shown. Unpaired t test, P value adjusted with Bonferroni correction. Data are shown as the mean ± SEM.